After the Washington band went back home after an accident, WSU wanted to do something. "It was let's play the (fight song)," said WSU band director Troy Bennefield. 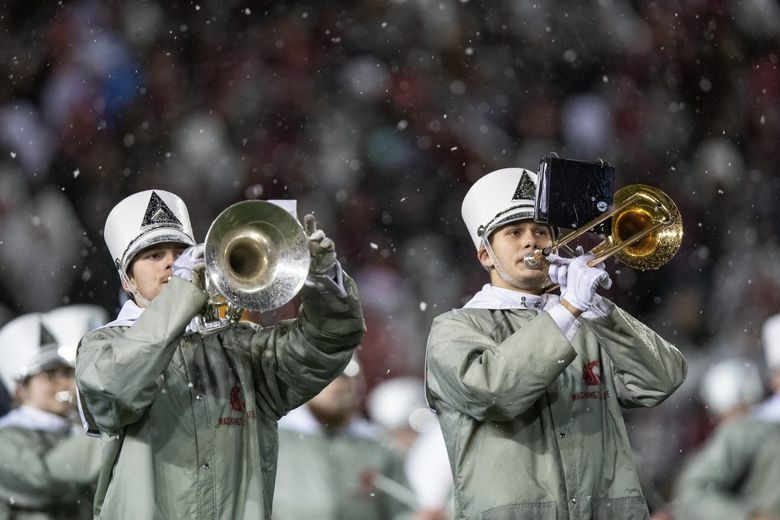 The rivalry between Washington State and Washington is unquestionably big for both schools, but for the Washington State band, brotherhood and camaraderie trumped rivalry Friday in Pullman. The Cougar band spent Friday afternoon learning how to play “Bow Down to Washington,” the UW fight song. The Husky band was not in Pullman as planned, going home after one of its buses flipped Thursday near George en route to Pullman, sending 47 of the 56 to the hospital. Two remained hospitalized Friday with “injuries that are not believed to be life threatening,” according to a release from the University of Washington. Bennefield said he can feel for what the Husky band is going through. The line started forming outside the Paradise Creek Brewery long before it opened at 11:30 a.m. It seemed everyone in town was wearing crimson and gray (the vast majority) or purple. “This is our year,” said WSU alumna Alicia Beck, who made the trip from Bellingham with her husband Rick. “We have an angel looking over us this year,” she said, referring to Tyler Hilinski, the WSU quarterback who died by suicide in January. Scott Wilbur of Wenatchee came in with a mixed crowd. Each year, about 30 members of his extended family get together to come to the Apple Cup. And somehow, their family of cats and dogs coexist.